Many thanks for the opportunity of speaking here today. This is a timely discussion. It occurs, of course, in the context of the Sustainable Development Goals, in particular Goal 8 to, “Promote sustained, inclusive and sustainable economic growth, full and productive employment and decent work for all”. This includes a clear target for an end to slavery and child labour. The deliberations of this Committee are therefore the first substantive international consideration of what practical measures may be put in place to help achieve the ideals of that particular goal. I believe that the UN Guiding Principles on Business and Human Rights, give us the clearest guidance on how these deliberations should proceed. They state that businesses have the responsibility to respect workers’ human rights while governments have the responsibility to protect those rights. Of course it is desperately difficult for businesses to uphold their responsibilities when states are failing so abjectly in theirs. That is a reality of the contemporary global political economy. Certain countries have sought to establish competitive advantage by scrapping the most basic of human rights protections for those who quite legitimately seek work in those countries. This cannot go on. And this Committee now has an opportunity to lead on how it should end. Decent work in international supply chains requires a number of quite basic protections in law and policy. It requires freedom of association. It requires an end to discrimination. It requires an end to tied visas and recruitment fees. It requires honest and sufficient systems of labour inspections to ensure that unscrupulous employers are not exploiting or enslaving vulnerable workers. It requires honest and sufficient systems of health and safety inspections so that poor people do not have to live with the threat that their working days may end by being burned to death, or crushed by collapsing concrete, as they toil to satisfy Northern hemisphere demands for cheap goods. As a board member of the Ethical Trading Initiative in the UK I know that many business leaders, like all people of conscience, crave governments to put in place measures such as these to level the playing field by compelling unscrupulous employers to act with a modicum of decency. So I respectfully but strongly suggest that this Committee must act to advance Sustainable Development Goal 8 by entering into a standard setting process on decent work in global supply chains to establish an international framework within which systemic risks and abuses can be addressed. If it fails to do so then we will have failed at the first on the promise of a better world that these Development Goals make. And vulnerable workers will, for years to come, pay for that failure with the destruction of their hopes and loss of their lives. As director of Anti-Slavery International it is, from time to time, heartening to hear from senior members of the U.K. Government their intent that the UK should be a world leader against slavery. Unfortunately these fine sentiments are hampered, possibly fatally, from the outset by some fundamental failures in domestic and international policy, most notably the failure to recognise the issue of caste as fundamental to both poverty and slavery for hundreds of millions of people in South Asia. There is a lazy trope that is sometimes wheeled out in discussions of slavery, that anybody can be enslaved. Technically this is true, particularly if people are caught up in the cataclysm of war. But this disguises a much more fundamental truth: that generally those who are enslaved are from discriminated against groups: indigenous people in South America; migrants and refugees in Western Europe; Dalits and Adavasi in South Asia. We have already heard in this meeting of the failure in British Government to confront the issue of caste in the UK itself. This is also a failure in UK’s development policy as exemplified by the Department for International Development’s withdrawal of aid from India on the presumption that the evolution of the Indian economy will lead to a it lifting all out of poverty. This is a forlorn expectation in a society that Dr Ambedkar recognised was one where “Caste restricts opportunities. Restricted opportunity constricts ability. Constricted ability further restricts opportunity. Where caste prevails, opportunity and ability are restricted to ever narrowing circles of people”. In other words caste is not a recipe for economic justice let alone an end to slavery, in a region where the largest number of enslaved people reside. The American historian, David Blight noted how in the pre-Civil War South of the United States even poor whites opposed the abolition of slavery because of the aristocratic privilege that it gave them. Dr Ambedkar identified that same aristocratic privilege in India when he recognised that the “caste system is not merely as division of labour, but a division of labourers”. And the sense of “aristocratic privilege” which emerges from this division of labourers facilitates the denial of rights to millions of Dalits. In general slavery, poverty and injustice are systemic, not individual issues. This is never more true than when they are underpinned by caste. And this goes to the heart of the matter of slavery: Its elimination is a profoundly political issue. It is about power and exclusion from power. Those who are enslaved are excluded from power in part so they can be enslaved. The attainment of civil rights and social justice that lead to an end to slavery are not inevitable achievements of economic development. They are often not even economically rational issues, particularly when those excluded from justice are from marginalised and discriminated-against groups. Hatred and prejudice are irrational and visceral but they are not unconquerable. Proper law and policy can counteract them over time if properly implemented. But of course caste prejudice limits the implementation and the impact of decent law and policy. We see this in India, for example, where there is much decent anti-poverty and anti-slavery law. Yet, corrupt police forces and overburdened court systems mean that such law is meaningless for those, such as Dalits and Adavasi, most vulnerable to slavery. Prime Minister Modi’s stated intent to encourage inward investment by reducing factory inspections and permitting child labour, amongst other so-called labour market reforms, will of course reinforce the caste system and increase the risks of forced and child labour across India. This will, in turn, increase the likelihood that any goods or commodities produced there are tainted by slavery-like practices. A short while ago Sir Simon McDonald, Permanent Secretary at the Foreign Office, said that human rights is no longer a priority in the Foreign Office, and instead was supplanted by the”prosperity” agenda. We see that reflected in the warm embrace the British government has given to Prime Minister Modi and the prospect of trade deals with an India whose supply chains are rife with forced and child labour. In the 1930s Franklin Roosevelt effectively ended child labour in the United States by banning it in interstate commerce. To introduce comparable measures into international trade, as President Obama has just done in the United States, would give pause to those who currently profit across South Asia from the exploitation and enslavement of others that is enabled by the caste system. If the UK truly wanted to be a world leader against slavery could begin by following President Obama’s suit and leading the European Union to similarly empower public officials to exclude the products of slavery from our markets. Today there are many politicians and a few philanthropists who crave the title “the new Wilberforce”. But few demonstrate the most fundamental qualifications for that title: That is the moral courage and clarity of thought to challenge the vested interests and the national and international political-economic structures, such as caste, that enable so much contemporary injustice. Until that happens the struggle to end slavery will remain unfinished, and that to end poverty will be a piecemeal affair, scarred by inequality and discrimination. Spenser is hired to find a kid who has become a bit of a ping-pong ball in a bitter divorce. What starts as a routine case is complicated by Spenser’s realisation that neither parent actually cares about their son. Always a bit of a softy, Spenser decides to take the kid under his wing to teach him to build, box, cook and the rudiments of feminism. 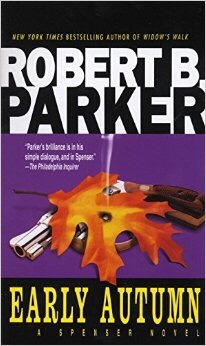 Early Autumn is a similarly themed book to Sixkill, the last Spenser novel written by Robert B Parker. It is about mentoring, perhaps even fatherhood, and how boys learn to become men. This leads to much of Spenser’s trade-mark philosophising and wry observations on life. This being Spenser, of course, his chivalrous act upsets some nasty Boston hoodlums and so Spenser and his buddy Hawk are compelled to show these gangsters the errors of their ways. In other words this is another fine chapter in the chronicles of Spenser – an efficient and thoughtful thriller without a word wasted. Agnes Magnusdottir has been condemned to death for her involvement in the murder of two men, one of them her lover. As she awaits confirmation of her sentence she recounts the events leading up to these deaths to a young priest, appointed as her spiritual advisor, and the members of the family she has been billeted with. Burial Rites is a sort of a Nordic “Crime and Punishment”. It is beautifully written and desperately sad, a story of both the physical violence that destroys lives, and the violence of poverty that destroys hope as well. It is a very rich book – a portrait of a poor rural community on the edge of the world in northern Iceland at the beginning of the 19th Century; a whodunnit; a book about the redemptive power of decency. At the heart of the story is Agnes – a fiercely intelligent woman cursed by the bad luck of her birth – finally finding a place in a family and a community as a sword of Damocles, in this case an executioner’s axe, hangs over her. It is a fine work, extraordinary also that it is Hannah Kent’s first novel.